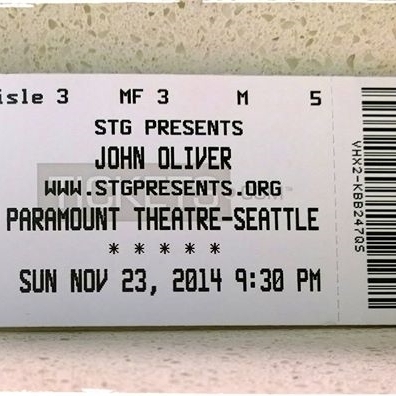 For nearly two hours, John Oliver entertained us at Seattle’s Paramount Theater, performing two sets for the liberal Seattlites who packed his sold out shows. 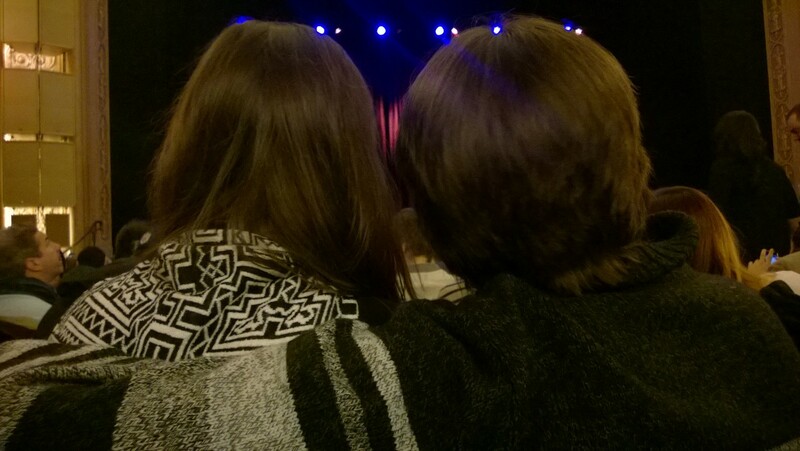 We scored good seats but a freakishly tall couple sat in front of us, not only very effectively blocking my view of the stage but, as they proceeded to feel compelled to hug each other, they formed a wall of attractive heads for me to look at instead of John Oliver. I needed a freaking booster seat. Hello, freakishly tall people, munchkin lady sitting directly behind you can’t see a damn thing!! Break off that unnecessary hugging crap and give me an opening to peer through. Please. I had expected John to be more politically focused but he really just told stories. Good ones that were thoughtful and funny. But first, he mocked the opulence of the Paramount theater with it’s over the top crystal sparkly chandeliers, purple velvet draping on the stage and gold leaf ceilings. I had never been there before but was impressed with it’s Broadway theater-like ambience. Yes, John, in your plaid flannel shirt and Levi’s, you looked comfortable but out of place. Very. As he put it, the fancy theater screamed OPERA! Vs. Comedy Central. Actually, John, you looked more in tune with a Boise vibe than a Paramount vibe. Take that you Brit Twit! Yes, core to his routine was Boise Bashing by John Oliver…WTF! He couldn’t find any other city to mock unmercifully? Seriously?? There are some really ugly, nasty places in the U.S.–take Gary, Indiana or Buffalo, NY (please), cities where I can’t believe anyone would actually choose to live. Sorry-just my opinion. Boise is a lovely town that hasn’t done anything to John Oliver and he probably has never even been there. So, Mr. Oliver, Boise does indeed have a downtown library with a large “Library!” sign. I think the exclamation point added to the sign is quirky and clearly conveys excitement for reading. John saw it differently—he thinks Boise residents are thrilled to even have a book in their teeny tiny hick town. Of course, Boise residents have heard of his stand up antics bashing Boise and are complaining loudly…good for you Boiseites—keep up the noise and invite John to visit. I can just see him now peddling the mobile beer bar around downtown-one loop and several brews later, John would be singing the praises of Boise from the gorgeous foothills that surround it. I forgive John for his Boise bashing because, damn he CAN do a mean pigeon walk…instead of twerking, he was all over the stage beaking as John likes to act out his stories. Bird going rogue at the Newark Airport….breaking news…makes travelers who normally ignore each other become besties as they laughed at the pigeon strutting his stuff at the boarding gate. Oddities like that bring people together in strange ways. Taking it one step further, he suggested that negotiators should throw a pigeon in with Netanyahu and Abbas and maybe they would laugh and make peace once they bonded over the fowl antics. Hmmm…..worth a shot, right? One story especially tugged at Thom and I’s heart strings. Sitting at the airport, John observed an old couple interacting. The wife wanted the husband to find her glasses in his jacket pocket. As he searched his pockets, he slowly withdrew his hand, middle finger extended and flipped her off, prompting fits of geriatric giggles. Thom and I just looked at each other and cracked up….we behave like that now and certainly won’t stop as we get older. I hope we can bring humor to those who see us interact, now and in the future. I only wish everyone could have as much fun as we do just finding humor in everyday life and certainly watching John Oliver’s antics–even with his Boise Bashing! I am still following you! Happy to see you happy and settled back into Seattle (with Thor!! )… We are settling into China and headed to Dragonfly for Christmas eve date night – inspired by you! 🙂 Merry Christmas! I am SO jealous! I was just saying to Thom that I totally miss my Dragonfly massage experiences so much! Enjoy them for me and keep having adventures. I’m getting ready to do an update blog post on Thor. I can’t imagine life without him. He loves his new big brother, Izaak, our Viszla who had been staying with my daughter while we were in China. Now we are all together in Seattle. How is your dog adapting? Keep me updated on how you are doing and if you need any advice, please let us know. I still have contacts over there in Beijing, Nanjing and Shanghai. I miss it all so much!